MIPTV’s “When media agencies become production powerhouses” (shown above) and “Superpanel: Turning Brands into Content Studios” panels both take on the question of brand (and oftentimes agency) involvement in content, from how agencies can work as executive producers with broadcasters and production companies, to how brands approach content creation (and ultimately distribution). “When media agencies become production powerhouses” was moderated by Videoink founder/CEO Jocelyn Johnson and featured Samantha Glynne, Global VP Branded Entertainment, at Fremantle Media; David Fletcher, Commercial Director Global Investment, Omnicom Media Group; and Ton Rozestraten, Chief Commercial Officer, RTL Nederland. Advertiser-funded programming covers a wide range of activities that tie brands or agencies to content, and on-air slots are increasingly sold to media agencies in exchange for TV content financing. But in addition to acting as production funds, are media agencies willing to play the role of executive producer? What happens to rights ownership for other players? At Fremantle, Glynne works directly with advertisers and brands, integrating them into shows. She also works with media agencies to see about financing shows through their production funds. In the Netherlands, RTL — represented by Rozestraten — is the market leader in Holland, working with agencies and advertisers to raise revenue. Finally, on the ad side, Fletcher said Omnicom spends about $50 billion of client money with media vendors. Johnson began by asking Glynne how she perceives the agency/broadcaster relationship. Johnson observed that on one side of the spectrum, you have strictly-financier relationships; on the other side, there are the agencies that want to own IP, with a wide middle ground in between. What aspect of this is tricky for the production company? Essentially, rights issues and fees aren’t so worrying; it’s a negotiation. But “creative involvement is more questionable — whether an agency wants to come on as a creative producer is on a case-by-case basis,” she said. From a Fremantle perspective, this is understandable: “We’re in 31 territories and we want to use our production companies to make the format in those territories,” said Glynne. A format that travels — even if the IP is shared — boosts the wins for everyone. She used the example of talking to RTL about a format, which, if successful in Holland, can easily migrate to other territories. “It’s not our business,” said Fletcher. “It’s a mistake if we try to be something we’re not. Let’s concentrate on what we’re good at: Planning and investing our company’s money wisely, and leave production to the people who do it best.” He also said that when agencies talk to production companies like Fremantle early on, ideas tend to be richer and have more legs. Next, we attended “Superpanel: Turning Brands into Content Studios.” It was moderated by Campaign’s global brand director Adrian Barrick, and included PepsiCo Creators League Studio‘s GM, Louis Arbetter; Wargaming project manager Valeriya Tsygankova; and Marriott International‘s VP of global creative & content marketing, David Beebe. But it’s also such successes that get brands wanting to run before they’ve even crawled. 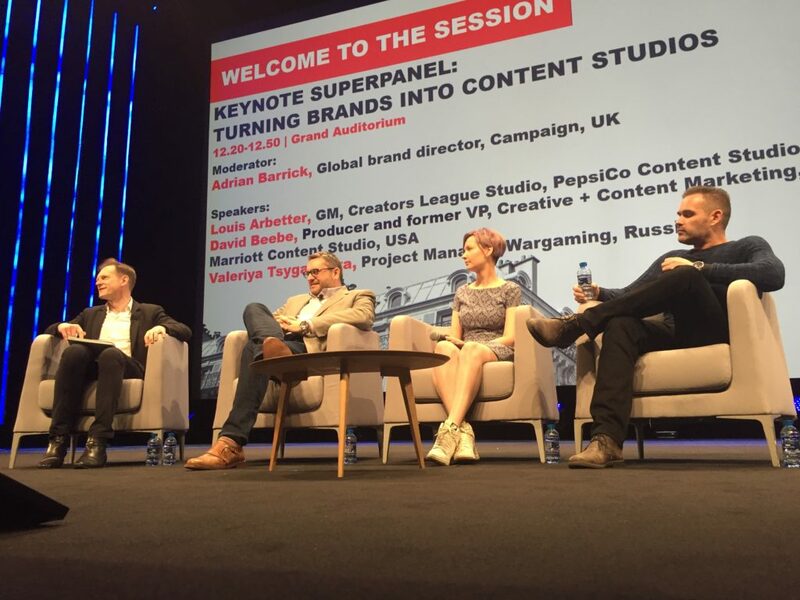 At PepsiCo’s Creators League Studio, “We go upstream into their strategy and the story they want to tell. Some of our brands are used to, ‘what is the summer season story I want to tell?’ They need a larger story,” Arbetter said. Once that’s identified, the team can decide how social, long-form, TV or other opportunities can play a role. Illustrating that, Beebe spoke to Marriott’s ambition to “own travel”: “All our content … should really inspire people to travel” before selling hotel rooms, he said. They also created sales packages to reinforce both emotional connections and a sense of service. The sales package for its French Kiss film included a good Marriott rate, plus a meeting with the general manager, and a private tour of sites where it was shot (like Paris’ Eiffel Tower). Barrick praised how Empire’s latest season will be done mobile-first, a project PepsiCo played a critical hand in, which PepsiCo’s vp-marketing and cultural connections Adam Harter discussed when the brand won Brand of the Year today. Some briefs boast ambitious goals but lack commitment to see it through, including from an investment perspective, he added. Examples of conversations Hyper captures can include someone tweeting “enjoying the wedding” or “having a great time at the pool” from a Marriott location, “whatever it may be,” Beebe said. “They may not tag us, but because of this technology we can capture that and make a decision about what to do”—like send the tweeter a bottle of champagne, poolside, then see if they reply. And they usually do. Marriott gets an 82 percent or higher response rate when it engages with customers via Hypersocial. “That’s another piece of content. Even though it’s social, it’s more content being developed,” said Beebe. As we wound down, panelists shared their views of how best to facilitate content productions with or as a brand. “We’re the bridge to the creative community. Whatever brand needs come through the door, we help refine and define those stories, we’ll go to the right storyteller for that brief,” said Arbetter. For example, when Gatorade wanted to tell real-life stories about athletes, it was combined with documentary filmmaker David Darg. Angela Natividad writes regularly for AdWeek, AdVerve and MIPBlog; she is also co-founder of esports-focused marketing company Hurrah. Personal Data collected by Reed MIDEM is the object of a processing intended to fulfill request for information or registration for newsletters and to promote Reed MIDEM’s tradeshows etc. In accordance with French law on data processing and liberties of 6 January 1978 modified in 2004, you may exercise your right of access and rectification concerning the data which is stored in our files contacting us at the following address: contact.cnil@reedmidem.com. If you do not wish to receive commercial offers from Reed MIDEM, please notify us directly by clicking on the following link: unsubscribe. &ast;&ast;This offer applies to non-retailers. Retailers who register early will benefit from an additional dedicated offer. Thank you for signing up to receive the latest TV Trends. Keep an eye on your inbox!